You can get to work in less than a minute. What’s your favourite New Zealand book? The Three Little Pigs by…..me. What do you love most about New Zealand? Serious now: the small population. What do you love most about libraries? They are a mark of a civilised society. Roger Hall is one of New Zealand’s most well-known playwrights. He has written for the stage, as well as scripts for radio, television and for children. 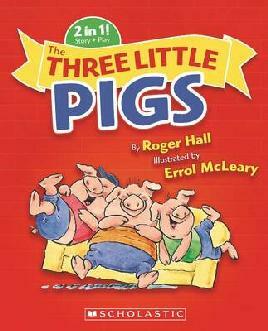 Roger’s retelling of The Three Little Pigs has recently been published by Scholastic New Zealand, which includes a play for five characters.